In 1842 a really funky invention entered the scene in England from the laboratory of the famous scientist Sir John Herschel. After experimenting at length with chemicals, sunlight, and photography, Herschel created the cyanotype print: an image development process that does not require a camera. Little did he know that a visit from Anna Atkins (1799–1871) would take his invention to a whole new level. Flash back to 1807 when a young Anna was just beginning her education, delighting in everything she and her adoring father, scientist John Children, discovered together. Anna’s bright, curious mind responded well to her father’s teachings. She absorbed a wide range of sciences by studying chemistry, physics, zoology, botany, and biology in an era when most girls were not offered significant academic opportunities. Fortunate to be the only child of a forward-thinking father, Anna excelled in understanding and organizing the natural world and was eventually admitted into the Royal Botanic Society in London—a huge achievement for a woman in 1839. Over the years Anna maintained a fascination for plants and became a leading botanist, collecting and evaluating specimens from the earth and sea. Science, however, was not the extent of Anna’s abilities. She also drew accurate reproductions of her collected treasures and illustrated a scientific guide to shells for a French publication her father had translated into English. Anna longed to make a publication of illustrations of her herbarium, but with over 1500 examples, the task was too overwhelming and remained a purely private enterprise. Until one fateful day in 1842 when Anna and her father stopped by for a visit with Herschel and witnessed a demonstration of the cyanotype process. The light bulb went on for Anna and she spent the next ten years creating cyanotypes (complete with Latin classification labels) of her collections and published them for an elite scientific community. Equally appealing for the scientific experience and the artistic aesthetic, The Bluest of Blues demonstrates that these two branches are not mutually exclusive. Beautifully illustrated in its own right, using the cyanotype style as a launching point, Robinson deftly incorporates artistically playful creativity into the mix. 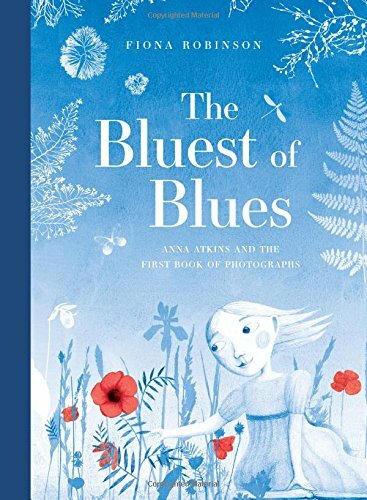 Combining her own drawings and cyanotypes with reproductions of Anna Atkins’ illustrations, the pages fill with well-designed montages of expression and imagination. In telling Atkins’ story, Robinson breaks away from the traditional narrative in favor of a timeline approach. Tracing key moments in Atkins’ life, the book reads like a bibliographic chronology one might find in the appendix of any fine art monograph, with dates being the primary transition points. The little bit of confusion that is not really addressed in the story or the notes is how cyanotypes are specifically related to photography. In today’s moment of the instant digital photograph, which is what most kids immediately comprehend, the cyanotype photographic development concept is too abstract. If the title had been Anna Atkins and the First Book of Cyanotypes, there would be no need to elaborate further. But the credit falls under the label of photography and the connection between the two is a leap to follow. It feels like a step is missing that could explain this succinctly. There is a note at the end of the book indicating now to actually make a cyanotype (which is a toxic process that requires serious adult supervision, after all, Atkins was 42 or so when she did this work), and young artist-scientists are encouraged to explore their own ideas. As with any medium, the potential applications are subject only to the limits of the imagination. The Bluest of Blues represents a win for spotlighting the significant historical contributions of a uniquely talented woman who was gifted with an imagination in tune to both the expression of artistic sensibilities and the accumulation of scientific knowledge.